Five defence bases earmarked for closure will now be kept open. Defence Minister Tobias Ellwood told fellow MPs the sites, in England and Scotland, had been spared the axe after "months of rigorous analysis". The closure of HMS Sultan, home to the Defence School of Marine Engineering and the Royal Naval Air Engineering and Survival School, will "now be delayed". However, Mr Ellwood said five other sites would be part of a "phased withdrawal and disposal". In an update to the Commons on the Defence Estates Optimisation Programme, Mr Ellwood said: "These decisions have been taken after months of rigorous analysis and reflect a clear-eyed assessment of the rapidly-changing threats faced by our nations." Mr Ellwood revealed a further three sites had been disposed of since the last time he updated the House, adding to the original nine he announced in July 2018. They are Defence Infrastructure Organisation Aldershot, Fitzwygram House - otherwise known as the Royal Army Veterinary Corps Centre in Hampshire - and the Joint Supply Chain Services in Longmoor. 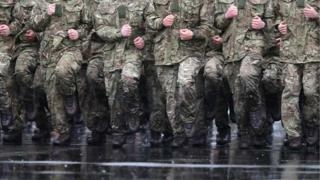 He said, as a result, £1.5 billion would be invested in defence estates over the next five years. In response, Labour's Shadow Defence Secretary Nia Griffith asked if the closures would effect recruitment, "particularly for reservists who obviously rely on facilities being within a reasonable travelling distance of where they live". Mr Ellwood said the issue was "very much on the forefront of our mind" when making decisions on closures, adding he did not want to lose reservists and cadets amid the process. He also pledged the 3 Commando Brigade would remain in Plymouth after fears the unit could be moved out of the city when it leaves its "spiritual home" at Stonehouse Barracks.